Since this is a personal blog, I would like to first talk about the things which inspire me to travel. To be precise, there is just one thing; books. I have been a bookworm since I was a kid and I have read about so many places that I have always wanted to be a traveler. The bucket list has been only growing with passing time. For example, I have read so much about Istanbul and the Ottoman Empire that I cannot wait to go there. Germany and, of course, the ‘fuhrer’ were no exceptions. Of all the books about Germany I have read, ‘The Book Thief’ by Markus Zusak was the sole book that stole my heart. It is a heart-wrenching tale of a little girl growing up in a war-torn Germany. The book depicts the confusions of a little heart in the wake of an anti-Jewish movement. She is bewildered because, the Jewish man inside her basement looks like a perfectly adorable person. Aah! How innocence is contrasted with the evil plans of the death angel! But another novel, ‘City of Women‘ by David Gillham, had completely left me yearning to explore Berlin, the city of poignant history and unfathomable charm. The book was impressive with a completely different angle of observing the same old subject- Germany’s shame and sorrow. What happens when all the men in the city are sent to the war and the city is left in the hands of its women? They wait in despair for their men to return, struggle to live on the meagre food supplies and brave the wrath of the Nazis to help their Jewish friends. What moves my heart is the strength these women show while doing what they believe to be right despite their infidelities in front of the emotional & physical void they are left with. 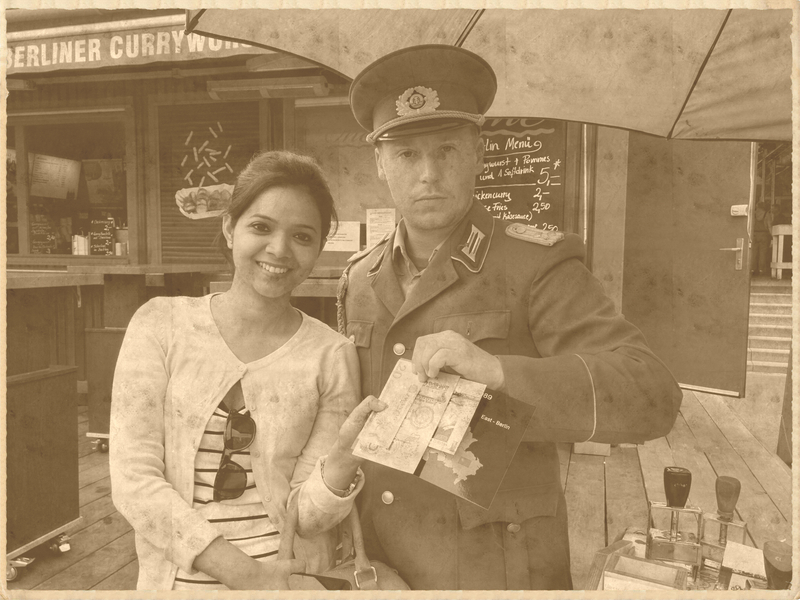 When I finally went to Berlin, I relived its pages. I visited the same old zoo where the protagonists exchange plans about their secret revolt against the Fuhrer. I rode in the same S-bahn where deadly transactions took place in the book and I walked through the same famous streets destroyed from severe bombing, now laced with modern architectur. If not books, there are too many reasons which could inspire you to visit Berlin. Each year, over 25 million people visit Berlin to relive the holocaust period, the cold war stories and the anecdotes from the socialist era. 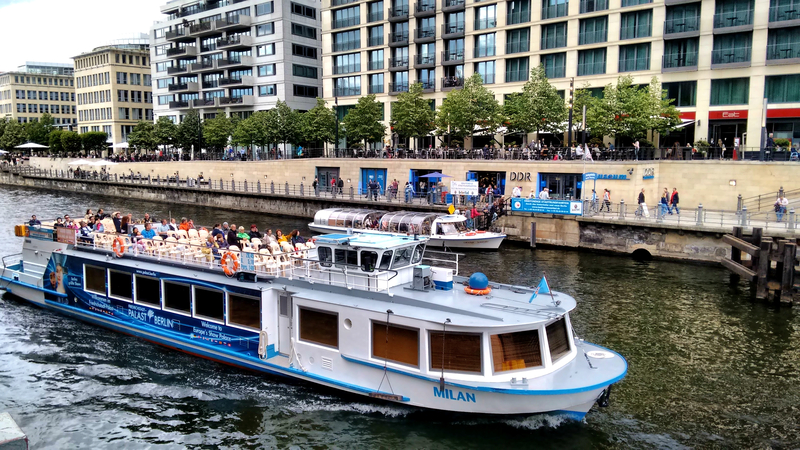 Each of these visitors finds the things of his own interest simply because Berlin is a huge melting pot of so many diverse things from history to architecture and from music to gastronomy. I too found mine. Berlin probably has the highest number of museums in Europe, but I am not a museum fan. They are usually expensive and time consuming. I would rather sit at a local café and have a little chat with some local people or fellow tourists. 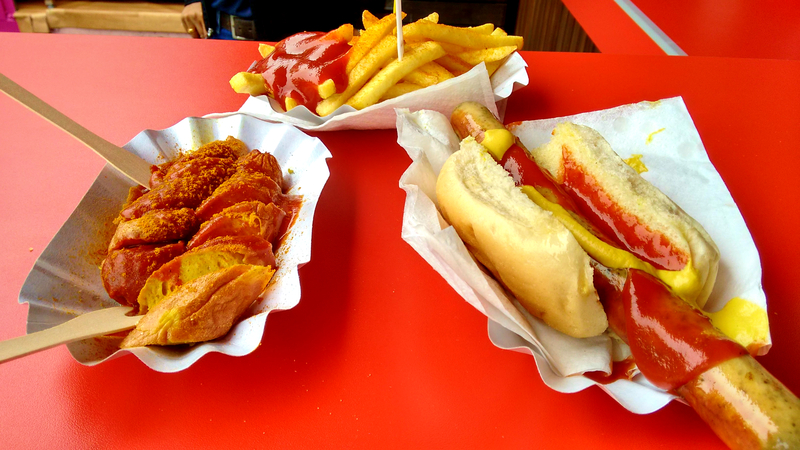 But Berlin has some of the weirdest museums in the world which you can’t ignore, one being the ‘Currywurst Museum’. A museum dedicated to the most popular street food in Germany! Apart from the history related to this dish you can also taste some original currywurst at the museum café. Sounds cool huh? The others include a museum for things that represent all the knick-knacks of a modern life. From barbie dolls to quirky innovations, you will find it all there. For more information on such museums click here. When most of the European cities have expensive food menus, Berlin throws in a delectable surprise. Berlin is simply a gastronomic delight. We ate to our hearts content in some of the small but awesome restaurants in the city. Since, Berlin society is an amalgamation of many cultures you will find any kind of cuisine in the city. From popular Indian food to native dishes from Vietnam, the choices are endless. You can hog on a three-course meal for two just for about 20 Euros at an average restaurant. And the street foods and drinks are darn cheap. 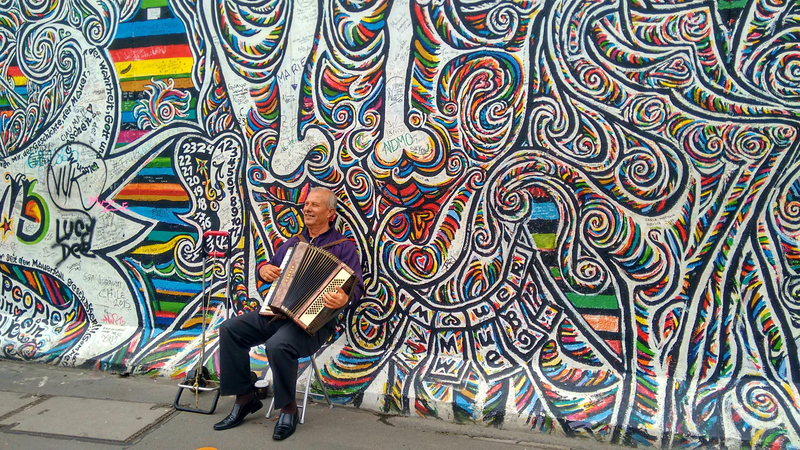 Enjoy a plate of steaming Currywurst or some doner kebab near the East Side Gallery of Berlin Wall for not more than a couple of bucks! Also, when in Berlin don’t forget to try Germany’s gift to the world; its Black Forest Cake. 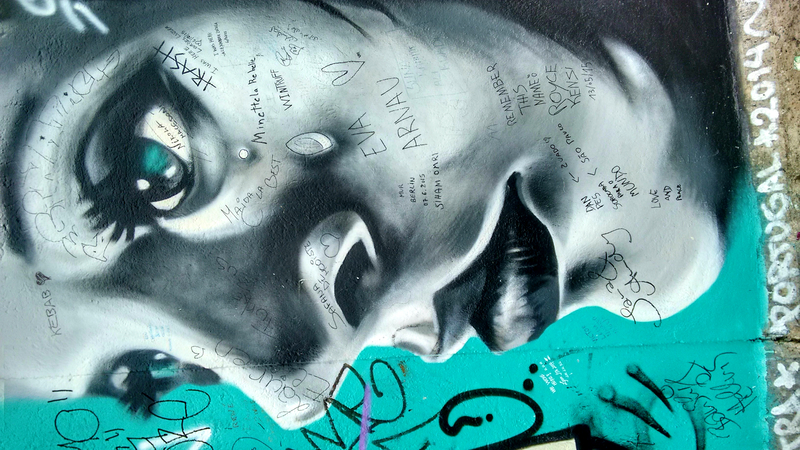 You have heard of the East Side Gallery and have seen its colourful graffiti. But this is not all. The city is strewn with pretty murals and they are not painted on tattered building walls. You will see colourful murals in sleek building, hotels and malls.. It’s like, German people breathe out colours. Need I say where do the artists from all over the world head for? Be it their 15 minutes of fame on the Berlin Wall or not. Walk into any random Berlin mall and you will be ushered into a world of quirky installations. Walk into any Berlin park you will have a headache thinking about the meaning of so many beautiful sculptures. I saw this water clock inside the ‘Europa Center’ near Berlin Zoo which had water flowing in drops and filling different beakers suggesting the hours, minutes and seconds. There, you can literally see time flowing! Again, I saw a strange grave in the middle of a pedestrian walkway. Not sure if it was actually a grave, but it sure had a cross, a flower wreath and someone’s name written on it. It cannot be any place but Berlin where you are politely asked by a German to keep your decibel level low at a public place. I found it quite strange as I wouldn’t imagine myself asking someone to hush up unless someone is being boisterous. But the same German people would come offering help with directions and any information at the slightest hint. 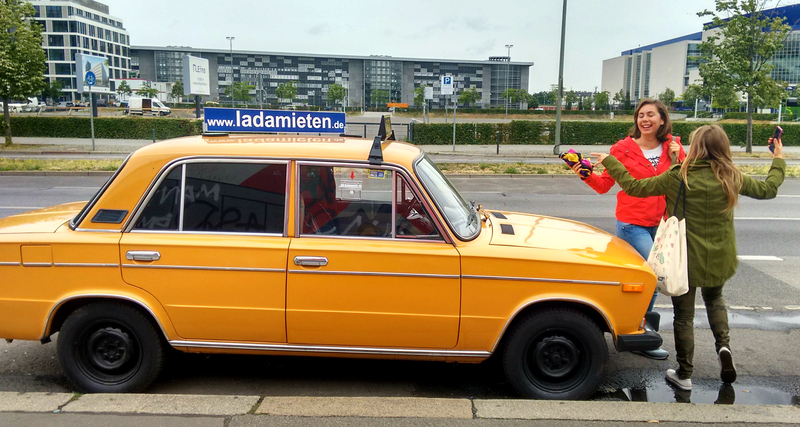 I would never forget all the friendly Germans who came up to ask if we needed help when we were standing clueless at a metro station. Charming, isn’t it? One gentleman, in fact, took the metro with us and walked us to our hotel! Another friendly restaurant owner treated us with a special drink on the house. The list just goes on. The other reasons too are special in many ways. 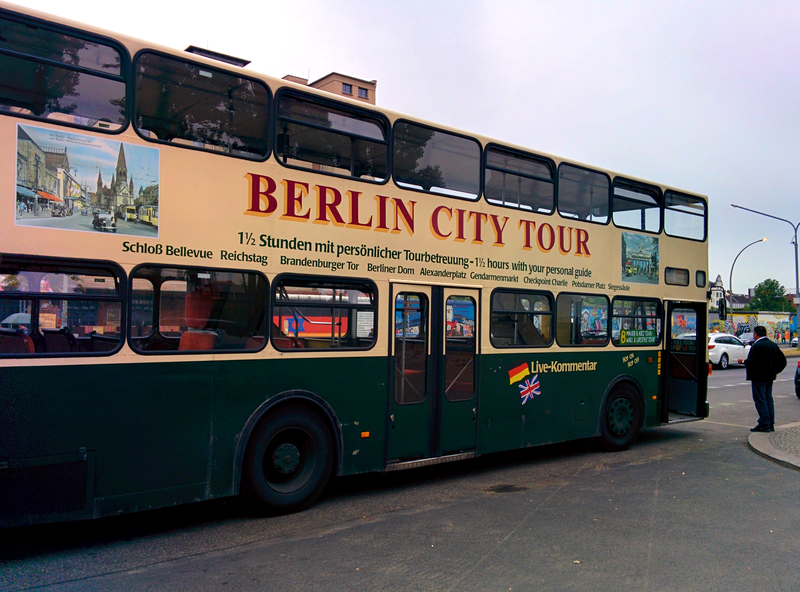 Free entry to exhibitions and some of the most popular tourists spots unlike other cities, cheap accommodation prices, vintage car tours and, not to forget, the underground tour of the wartime Berlin, what else can you ask for. The last one should be actually in the top 5 list. But I have already written my piece and I am feeling too lazy to change it. Suit yourself to change the orders. Who’s in for some Currywurst?